Pasta steamers are a convenient way to cook noodles, especially if you are preparing a meal for a large number of people. Although they are called steamers, the pots cook pasta in boiling water similar to any other pot. The difference is that a pasta steamer includes a basket that holds the pasta while it is submerged in the pot of water, allowing you to easily drain the noodles without having to lift and empty a heavy pot of boiling water. Pasta steamers are suitable for dried or fresh pasta, and noodles of all shapes and sizes. Fill the pot of the pasta steamer with water to about 2 inches from the top; this will allow you to submerge the steamer basket without having water spill over the edges. Place 1 tsp. salt into the water; the salt seasons the pasta and helps it to cook evenly. 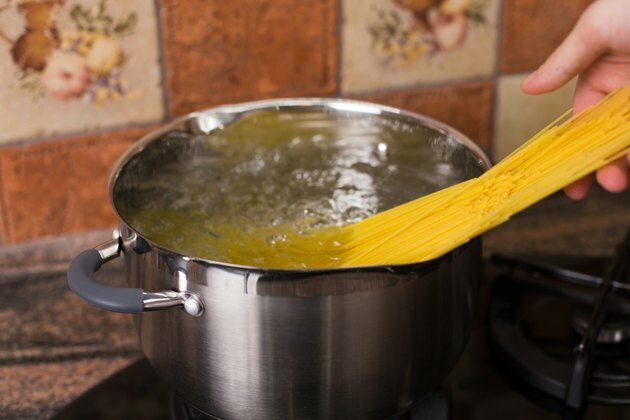 Place your pasta into the steamer basket and place the basket into the pot of water. The steamer basket should have handles and allow you to easily place it in the pot without having to come in contact with the boiling water. Return the water to a boil and cook the pasta for the appropriate amount of time. Fresh pasta takes only a few minutes to cook, whereas dried pasta can take anywhere from eight to 12 minutes. Remove the pasta from heat when it is tender yet still firm. Drain the pasta by simply lifting the steamer basket out of the water. Run the pasta under cool water to stop it from cooking any further. Can You Cook Pasta Overnight in Cold Water?